Yesterday Skype released the “Gold” or “user” version of Skype 5.5 for Windows. Many of the features, including the Facebook integration, were discussed in Skype for Windows 5.5 beta: First Impressions with Facebook Integration and Skype for Windows 5.5 beta: The Call Bar. In the final release these have been enhanced; at the same time Skype introduced some amusing new emoticons – some in the emoticon table for the chat message; others are “hidden”. Facebook Enhancements: In the beta there was little to identify whether you were in a chat session with a Contact’s Skype chat or Facebook chat. With this release, the Facebook icon appears at the top of the conversation pane. However, confusion can still arise. In the Contacts pane “Recent” tab there is no way to identify whether one would be communicating with the Skype chat or Facebook chat. Product management is probably conflicted because they also want to show the contact’s presence information … maybe a blue icon for Facebook chat presence would help. Notice also that if you are in the Contacts Facebook chat conversation, the call bar only allows you to call PSTN numbers (via SkypeOut) but not place a Skype-to-Skype call, as would be expected. 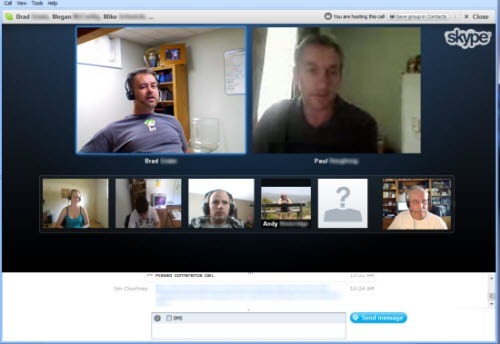 You can still set up a conference call and monitor your hardware and network conditions via the call bar. Finally the Facebook news feed content has been moved to the Skype client Home Page tab (no longer a separate tab) but still continues to show the profile pictures (avatars) for the most contacted Contacts (either through calls or chat sessions). When you enter a Mood Message on the Home Page tab, there is an option to share the message on your Facebook news feed. 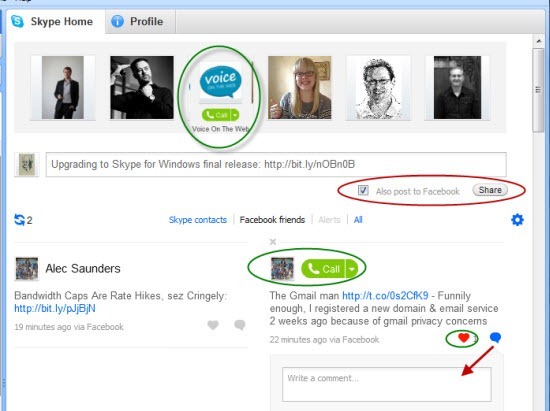 Running your cursor over any of the Skype profile pictures along the top row or a Facebook message will bring up a Call button which can launch either a Skype-to-Skype call or a SkypeOut call with the Contact. It will be interesting to see how the various calling services evolve in both the Skype client and Facebook itself as Skype’s integration into Facebook deepens beyond the initial Facebook Video Calling introduced three weeks ago. 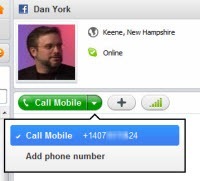 Dan York adds his comments on the implications of the Facebook Chat integration in Skype Opens Its Walls A Bit? Lets You IM Facebook Users Just Like Skype Users. Emoticons: not something I used a lot but I can see using them more often; when appropriate in the context of a chat session I might use only a few of the emoticons. However, today Skype introduced several new emoticons as shown on the right. Most amusing is the “wfh”, a hidden icon that I can see many users in today’s virtual commuting world having an association with (although more often in their Skype Mood Message). Skype has several hidden icons, as shown on the left – sometimes called “Easter eggs”. I’ll not give the shortcodes but many of them can be implied from the name. “Working from Home” is very dynamic rotating between the two images shown in this graphic. For those who are totally puzzled and frustrated there is a hidden “wtf” button. Suffice it to say that these icons have created much discussion and amusement today. Skype for Mac’s Chief Whining Officer, Dan York made himself heard arising out of our musings earlier today when the release was first announced. Let’s hope they appear in a forthcoming Skype for Mac release. Actually both sides of the conversation need to have Skype for Windows 5.5 “Gold” release in order to see these emoticons properly. The Call Control Bar (or Call Navigation Bar) has been modified slightly. Most importantly it continues to offer the Call Quality Info feature – perhaps its most useful feature where you want to monitor and modify conditions during a call. Also very useful is the PopOut window during a video call which allows you to watch the video image while using other applications during a call. In this version we have made numerous ‘under the hood’ updates to our video engine to improve its reliability. We have reduced the amount of graphic card resources needed for video calls and improved support for older cards, especially for users with SiS graphics cards. Full disclosure: the Skype Group Chat is being hosted on a quad core PC with a 1.7 Mbps upload speed on the Internet connection. Being the “Gold” or “ user” release, Skype for Windows will probably auto-update at some point. However, if it does not or you want to try it out now go to Help | Check for Updates or click here to access the download. By the way notice that the Help Menu now includes a link to Skype’s Heartbeat page – not sure if this is new but worth drawing attention to, as one qick check on the service status. Don’t know if this arose out of the comments re Phil Wolff’s “Heartbeat” suggestion reference by Tony Bates in the Skype Journal interview at CES last January.